Our ways differ from yours. Are you “civilized” people really willing to let Lyme’s Disease trot up to your kids in the parking lot?! That guy should be getting a medal, not an arrest. 4 Responses to Let my people go! 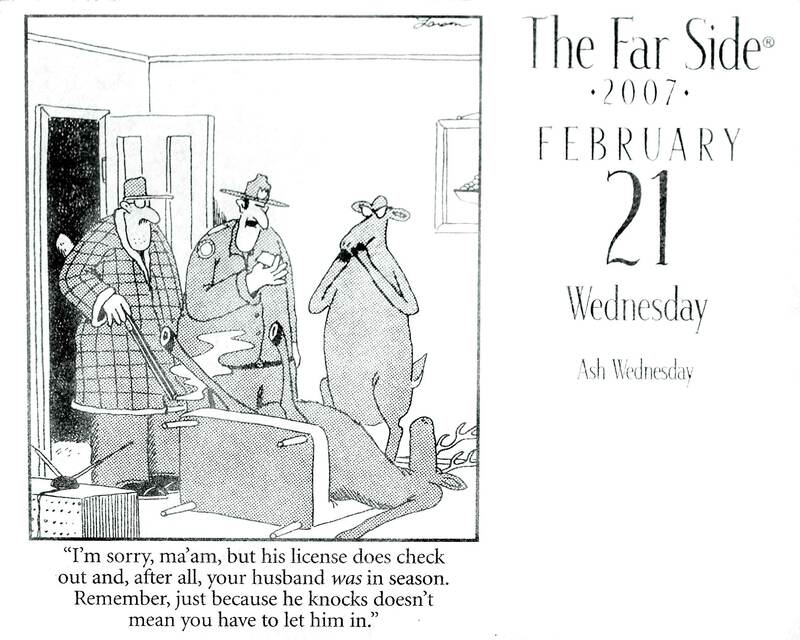 Ah, one of my favorite Far Sides. The original, unpublished caption ended with, “I will ask him to field dress you husband outside.”… or something like that. Yeah, cause hunters are horrible people, right? Though, this guy chased the deer down with a handgun? that’s pretty badass. Those buggers are very fast. This fellow is clearly not a shooter. I’m pretty sure that someone, who has the balls to chase down a deer with a handgun, wouldn’t just spray rounds around like a banger from the Windy City. Bullets don’t just stray. I doubt that anyone was at risk. The US is funny, we have massive wildlife support programs but won’t generally put a predator near people. So we’ve gotten things like deer to repopulate massively where they have few natural predators, if any. Then they run wild and we end up having to argue scheduling hunts to reduce them.